The MITS (Micro Instrumentation and Telemetry Systems) Altair 8800 was announced on the January 1975 cover of Popular Electronics, which boasted you could buy and build this powerful computer kit for only $397. The kit consisted at that time of only the parts to build a case, power supply, card cage (18 slots), CPU card, and memory card with 256 *bytes* of memory. Still, thousands were ordered within the first few months after the announcement, starting the personal computer revolution as we know it today. Many laugh at the small size of the that first kit, noting there were no peripherals and the 256 byte memory size. 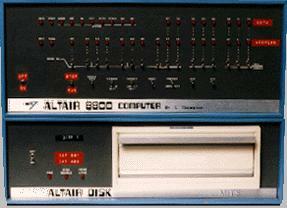 But the computer was an open system, and by 1977 MITS and many other small startups had added many expansion cards to make the Altair quite a respectable little computer. The "Altair Bus" that made this possible was soon called the S-100 Bus, later adopted as an industry standard, and eventually became the IEE-696 Bus. The simulator for the Altair 8800 was developed by Charles Owen. The updated version with a Z80 CPU was developed by Peter Schorn.